The proportion of children in Class 5 who can do simple division has gone up from 24.9% in 2012 to 27.9% in 2018. The reading levels of class 3, which was assessed by the ability to read Class 2 textbooks was inching up since the low of 2010 (19.5%) and now stands at 27.2%. Kerala tops in Class 5 reading levels with 77.5%, up from 69.4% in 2016. This growth is driven by state-run schools i.e.10% rise in reading levels in government schools compared to 7.3% in private schools. Wide-disparities among states in learning levels. In Uttar Pradesh, over 60% of Class 3 children cannot recognise letters or read words whereas in Himachal Pradesh over 70% of children are either at grade-level or only close behind. Only a quarter of all children in Class 3 are at their grade-level, only 27.2% of these children can read a Class 2 textbook and only 28.1% can do Class 2-level subtraction. These sobering realities demand policy interventions. The government must devise a policy direction to address these critical gaps in learning while it formulates the National Education Policy. Nearly 90% of employable people did not receive any vocational training, posing a challenge for the government’s Skill India Campaign. While 75% in Germany and 80% in Japan. 50% in China are skilled. Govt target to impart skills training to 40 crore people by 2022, and the new govt has a dedicated Ministry of Skill Development and Entrepreneurship. Proportion of young adults who had received vocational training was virtually unchanged between 2004-05 and 2011-2012. There remain multiple decision-making authorities on skills and little clarity about who exactly will do the work. Promise of corporate and foreign partnerships on skilling are pouring in, but how these mass skilling programme will take off is unclear. Need to design curricula as per changing job requirements. The Union cabinet gave its nod for the formations of Indian Skill Development Service (ISDS). Indian Skill Development Service (ISDS) will be a Group ‘A’ service of the technical cadre of the Ministry of Skill Development & Entrepreneurship (MSD&E). ISDS was earlier called the Directorate General of Employment & Training which was under the aegis of Ministry of Labour Employment. To improve skill development administration in the country. To enhance the capacity and efficiency of the organization. The cadre will be selected through the Union Public Service Commission (UPSC) and have the same ranks and profile as other Group A services such as the Indian Revenue Service, Indian Audit and Accounts Service and Indian Railway Service. The new cadre of officers will run the skill development and entrepreneurship ministry, help implement various skill and apprenticeship schemes conducted by the ministry as well as those by the Directorate General of Training (DGT). The new officers will help formulate skill policies, devise a road map for improving the apprenticeship system, revamping ITIs and also help revamp course work for various schemes. India aims to skill some 500 million people by 2022 in both organized and unorganized sectors to improve the efficiency of the work force, provide job-ready human resources to industries and ultimately improve the competitiveness of a young demography considered crucial for the economic growth of India. To achieve these objectives, it is necessary to have such a dedicated service. Skill India Mission is an initiative of the Government of India, launched by the Prime Minister on the 16th of July 2015 with an aim to train over 40 crore people in India in different skills by 2022. The mission was launched for creating convergence across various sectors and different States in terms of activities relating to skill training. The mission would, along with consolidating & coordinating skilling efforts, expedite decision making across sectors to achieve quality skilling on a large scale. The scheme would be implemented through a streamlined institutional mechanism driven by Ministry of Skill Development and Entrepreneurship (MSDE). The policy intends to create a skilling ecosystem on a large scale. The objective of the policy is to meet the challenges of skilling at a large scale with quality and speed, enabling the individuals to realize their full potential through the life-long learning process where the competencies are garnered via instruments such as credit accumulations, credible certifications etc. PMKVY is a flagship scheme of the Ministry of Skill Development and Entrepreneurship (MSDE). It was launched with an objective of enabling a large number of youth in India to take up skill training that is relevant to specific industry, which would help them in securing a better livelihood. The individuals with prior skills and learning experiences would also be certified under Recognition of Prior Learning (RPL) component. The scheme caters monetary rewards to those individuals who have successfully completed the sanctioned training programmes. Sector specific skill councils such as Agriculture Sector Skill Council, Food Industry Capacity and Skill Initiative (FICSI), Health Sector Skill Council etc are established under the scheme. The skill loan scheme was launched with an intent to support the youth willing to take up skill training programmes in the country. This Skill Loan Scheme replaced the earlier Indian Banks Association (IBA) Model Loan Scheme for Vocational Education and Training. Any Indian National taking admission in a course offered by Industrial Training Institutes (ITIs), Polytechnics , school recognized by Central or State education Boards, college affiliated to recognized university, training partners affiliated to National Skill Development Corporation (NSDC) Sector Skill Councils, State Skill Mission, State Skill Corporation can avail loan under the scheme. The repayment period under the scheme is 3 to 7 years. This scheme does not discriminate against women. Union Ministry of Human Resource Development (HRD has officially decided to participate in Programme for International Student Assessment (PISA) after gap of nine years. It will send team of officers to Paris to negotiate India’s terms of participation in PISA 2021. The test is designed by education experts around the world. It assess how students apply what they have learnt to real-world problems. PISA test results give insight into education systems around the world. The results are shown as a national mean score and not shown individually. Its objective is not to rank countries, but to see how education system can be improved. 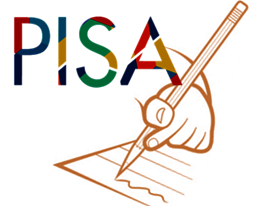 Countries willing to participate in PISA choose kids from different regions to represent sample of 15-year-olds in their country. In 2012 PISA test, schools of Shanghai in China topped reading, mathematics and science test, followed closely by Singapore. In 2015, Singapore, Japan and Estonia were ranked as top three countries, in that order. India had made its debut in PISA in 2009 with 16000 students from 400 schools across Tamil Nadu and Himachal Pradesh. However, students had performed miserably in 2009 test and India was placed at 72nd among 74 participating countries. Government had blamed “out of context” questions for the poor results in 2009 and decided it won’t participate in 2012 and 2015. In 2016, HRD Ministry had revisited this decision and Kendriya Vidyalaya Sangathan (KVS) had set up committee to review matter and submitted its report in December 2016. 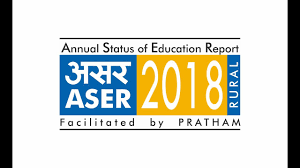 The report recommended for participation in test in 2018. Similar recommendation was made in 2017 by group of secretaries on education constituted by Prime Minister Narendra Modi. However, India had missed the application deadline for 2018 cycle of PISA test. India would be taking part in the 2021 test. Kendriya Vidyalayas, Navodaya Vidyalayas, and all schools, private and government, in Chandigarh will participate in the 2021 test. OECD would also be conducting PISA-like assessment for students of Kendriya Vidyalayas (KVs) and Navodaya Vidyalayas (NVs) annually from 2019 to familiarise themselves with their testing pattern in the run-up to the grand assessment in 2021. The growth of these and other national institutions will also depend on policies to raise the expenditure on R&D as a percentage of GDP. Among countries with a comparable research output, India with 0.8% R&D spending trails Russia, Brazil, South Korea and even Singapore, according to UNESCO data. It should be ensured that this conditional recognition is fulfilled transparently, and that it meets the requirements on governance structure, infrastructure and faculty within three years. That there is need for urgent reform became clear during the selection process: the empowered committee found that State universities had a low output because some of them had several faculty members recruited on contract basis, with no incentive to do research. Such ad hocism must end, and public universities should be insulated from political pressures. Vice-chancellors should be appointed on merit, free of ideological biases. With good governance structures and significant new financial grants, the selected public institutions will be able to innovate on courses and encourage research. The quality is uneven, and at the bottom levels, abysmal. At the same time, initiatives by charitable trusts — which have declined due to political support for commercialisation and aid cuts — must be welcomed, as this would help open more affordable colleges and universities. 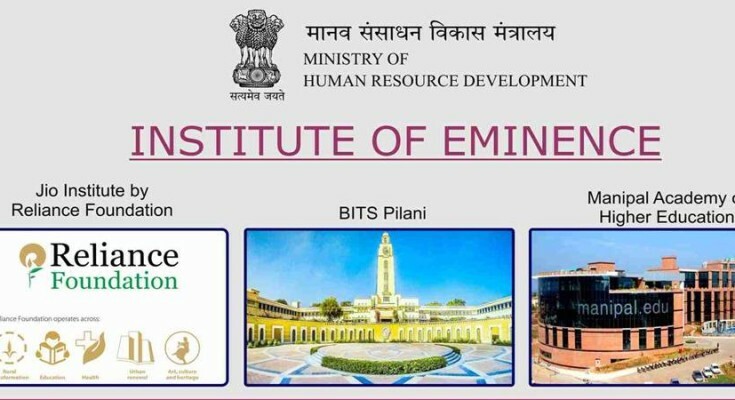 The idea of developing centres of higher learning advances the Nehruvian vision of building ‘temples of modern India’. Islands of eminence can inspire, but the long-term goal should be to raise the quality of higher education in all institutions through academic reform. The Institution of Eminence (IoEs) can become models of autonomy, academic innovation and equity of access, and lead to a transformation of higher education. 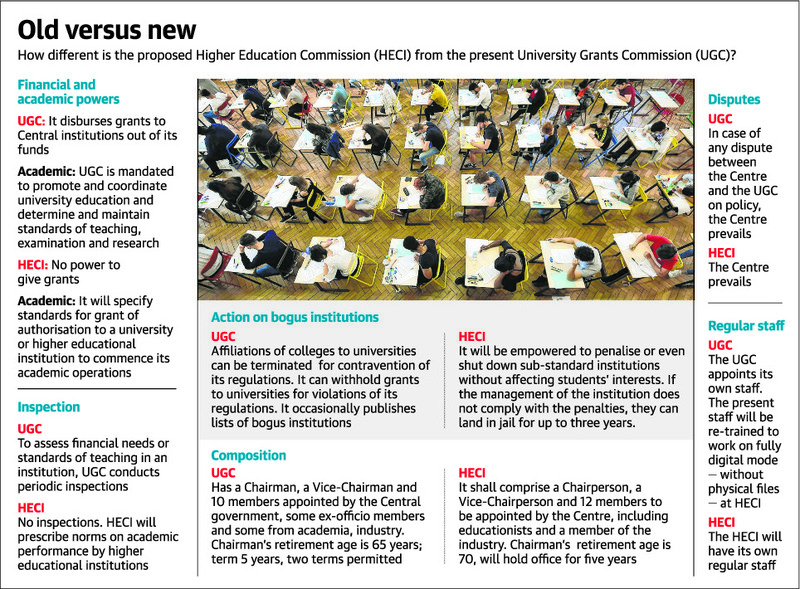 The government is set to replace the apex higher education regulator, University Grants Commission (UGC), with a higher education commission by repealing the UGC Act, 1951, for better administration of the HE sector. Centre has placed in the public domain a draft Bill for eliciting suggestions from educationists. The draft Higher Education Commission of India (Repeal of University Grants Commission Act) Act, 2018, takes away funding powers from the proposed regulator and gives it powers to ensure academic quality. The new regime separates the academic and funding aspects of higher education. While HECI will be in charge of ensuring academic quality in universities and colleges, the Ministry of Human Resource Development (MHRD) – or another mechanism that will be put in place later – will be responsible for funding universities and colleges. Another key feature of the draft legislation is that the Regulator will have powers to enforce compliance to the academic quality standards and will have the power to order closure of sub-standard and bogus institutions. Moreover, non-compliance could result in fines or even a jail sentence (Till now, the UGC had no such powers. All it could do was to release a list of bogus institutions and not recognise their degrees). The HECI will have a Chairperson, a Vice-Chairperson and 12 other members to be appointed by the central government, including ex officio members, eminent academics and a doyen of industry. Of the 12 members, three members will represent union government namely: secretary of higher education, secretary of ministry of skill development and entrepreneurship and secretary, department of science and technology. The secretary of the commission will act as the member-secretary. HECI is tasked with the mandate of improving academic standards with specific focus on learning outcomes, evaluation of academic performance by institutions, mentoring of institutions, training of teachers, promote use of educational technology, etc. It will develop norms for setting standards for opening and closure of institutions, provide for greater flexibility and autonomy to institutions, lay standards for appointments to critical leadership positions at the institutional level irrespective of university started under any law. The transformation of the regulatory set-up is based on the principles of minimum government and maximum governance, separation of grant functions, end of inspection raj and focus on the academic quality. The draft Act is in accordance with commitment of the government for reforming the regulatory systems that provide more autonomy to higher education institutes to promote excellence and facilitate holistic growth of the education system. UGC staff would be retrained to adapt to the HECI regime, which would be fully digital and do away with file work. Once the HECI Bill is passed by Parliament, the technical education regulator AICTE and the teachers’ education regulator NCTE will also be reformed on similar lines. All India University Employees Federation strongly opposed HECI. The University Grants Commission (UGC) has served India’s higher education system for over six decades. Named as the Higher Education Commission (HEC), this new institution will cover a considerable part of the UGC’s mandate, minus the latter’s financial role. This function will go to the Ministry of Human Resource Development (MHRD). Not surprisingly, the academic world is apprehensive that the move will increase the power of the ministry to curb what little autonomy is left in the system of higher education. The Yash Pal Committee never suggested that the UGC should be “scrapped.” The term it used was “subsumed,” pointing towards the need to let the UGC look after the crucial task of equitable distribution of funds, while a larger, essentially deliberative body looks after and encourages the long neglected task of building curricular and research bridges between different disciplines and disparate areas of higher professional learning. What is now being contemplated is the transfer of the UGC’s financial role to the MHRD. This is contrary to the Yash Pal Committee’s recommendations, even though the idea of bringing certain areas of professional education under the proposed HEC partially echoes the committee’s report. Regulating school fees is one of the most significant legal and political challenges policymakers in India face. The issue of fee regulation finds itself at the intersection of constitutionally protected freedoms enjoyed by private schools and the need for making quality education affordable and accessible. Over the years, the issue of skyrocketing tuition fees has confronted parents. Adding to their burden is the annual and steep hike in tuition fees along with additional costs such as fees for transport, extra-curricular activities and sports. The managements of such schools claim that these hikes are reasonable and justified as the costs of maintaining a fully functional private school with quality teaching and world-class infrastructure are quite steep. In this context, balancing the autonomy of private schools and their public welfare function becomes a contentious issue. There are around 3,50,000 private unaided schools (24% of all schools) where 75 million children or 38% of all students, study. So can private schools arbitrarily hike fees? In M.A. Pai Foundation v. State of Karnataka(2002), the Supreme Court held that regulatory measures imposed on unaided private educational institutions must, in general, ensure the maintenance of proper academic standards, atmosphere and infrastructure and the prevention of mal-administration by the school management. Subsequently, in Islamic Academy of Education and Anr. v. State of Karnataka and Ors(2003), a Constitution Bench of the Supreme Court held that these institutions have the autonomy to generate surplus which must be used for their betterment and growth. While private schools are ‘entitled to a reasonable surplus for development of education and expansion of the institution, there has to be a balance between autonomy of such institutions and the measures taken to prevent commercialisation of education’. However, there is not much clarity on what the terms “surplus”, “reasonable surplus” or “commercialisation of education” entail. In order to prevent private schools from charging unreasonably high fees and to prevent misuse of funds, several State governments have either enacted fee regulation laws or are in the process of framing them. 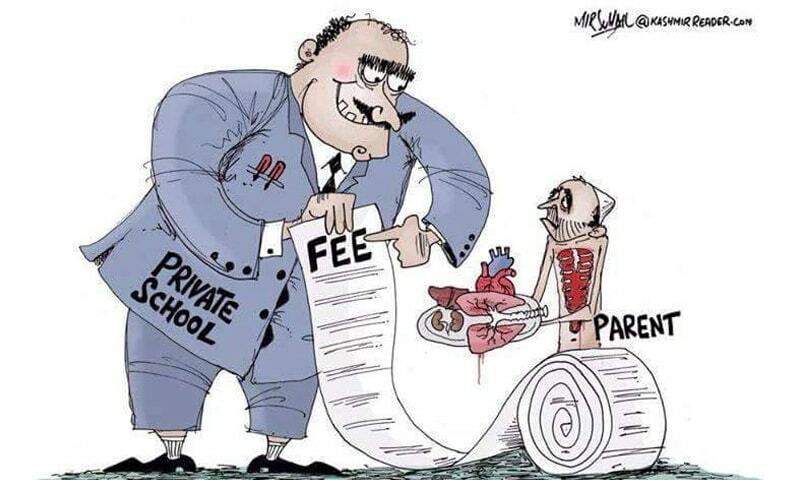 States such as Tamil Nadu follow the fee fixation model whereby a government committee is empowered to verify and approve fee structures proposed by private schools. Karnataka is for a formula that caps fees for schools by way of framing rules under its school education legislation. Maharashtra has a weakly enforced legislation to regulate fees and has multiple government bodies to approve school fees. Recently, the Maharashtra government’s decision to cap proposed fee hikes at 15% was widely criticised by schools. A recent order of the Gujarat High Court upholding the validity of the Gujarat Self Financed Schools (Regulation of Fees) Act, 2017 is now being reconsidered by the Supreme Court. The court has directed the government to not take any coercive steps against schools in the interim period. As of now, these models are affected by the challenges of weak implementation, a lack of capacity and constant legal challenges posed by private school associations. There is a larger irritant which is entrenched in the way private schools operate. In 2010, the Comptroller and Auditor General slammed 25 well-known private schools in Delhi for arbitrary fee hikes. According to the report, money was being collected from parents under false heads, while at the same time, teachers were being underpaid, and accounts misrepresented. Existing legislative efforts have made an incomplete assessment of the deeper problems with financial management and accounting practices adopted by private schools. The new wave of fee regulation laws being debated and enforced in States has the potential to address the problems Indian parents face. However, there is still a lack of jurisprudential clarity on what private schools can or cannot do, how much “surplus” they can make, or what “commercialisation” actually means. In order to make these laws more effective, the solution would be to address the disease of financial mismanagement and misreporting, and not the symptoms. In Modern School v. Union of India(2004), the Supreme Court recommended accounting standards for private schools. Further, measures such as regular government supervised audits, generating capacity in State-level Departments of Education, regular inspections, and stricter sanctions for fraudulent reporting could be considered. Aim is to put in place uniform fee framework to check frequent and arbitrary increases in school fees by unaided private schools. It proposes fines on schools if they violates uniform fee framework. These schools will be fined 1% of revenue it generates for first instance of violation of these rules and it will increase to 2 % and 5% for second and third violation. Note: The regulation of education-related matters is domain of HRD ministry, but NCPCR has stepped in to draft fee regulations for unaided schools, citing Section 13 of Commission for Protection of Child Rights (CPCR) Act, 2005 and Section 32 of Right to Education (RTE) Act, which gives it authority to review safeguards under law to protect of child rights and recommend measures.